Product #21495 | SKU 33974 | 0.0 (no ratings yet) Thanks for your rating! Connect additional monitors to your computer with the Kensington USB 3.0 Multi-Display Adapter . This adapter connects to your computer via USB and has a built-in DVI port for connecting devices like monitors, HDTVs, and projectors. VGA connectivity is also available with the included DVI to VGA adapter. This unit is powered by its USB connection and includes a USB cable. 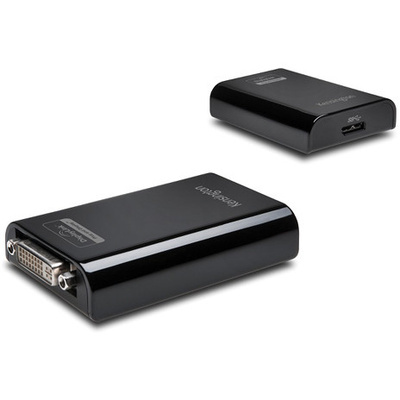 The Kensington USB 3.0 Multi-Display Adapter is compatible with PC and Mac and includes drivers for installation. This device is also compatible with USB-equipped Windows 8 tablets, drivers for tablets and other devices that lack optical disc drives are available for download from the manufacturer.